It has been almost five years since we last set foot on Cunard’s Queen Mary 2 so the lure of a three day voyage to Bruges and back was too much to resist. Thus we found ourselves on what would be our fifth time on this amazing ship, which holds a very dear place in our hearts. As well as being the only real ocean liner in the world, she can also stake claim to being the first ship we ever sailed on just over eight years ago. Back in 2010 we were both celebrating ‘big’ birthdays and a significant wedding anniversary so we decided to treat ourselves to a holiday without our children and chose a transatlantic voyage (Rich probably knew that unless he made communication with home almost impossible I would spend the entire holiday worrying about them and talking to them). Anyway a week on QM2 later and we were hooked, our love affair with cruising was ignited. 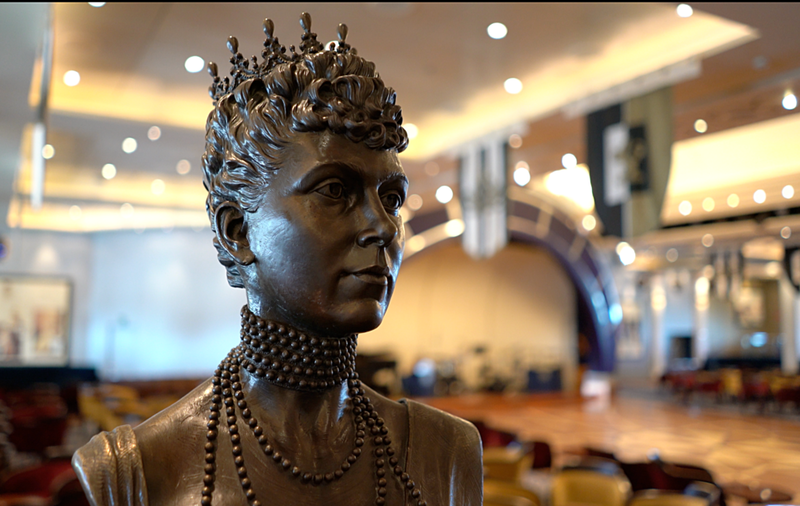 The infamous Queen Mary bell situated in the Grand Lobby of the Queen Mary 2. Although this would be our fifth time on her she has undergone some significant changes since we were last on her so we were looking forward to seeing the results of her remastering. We boarded her Thursday lunchtime on a cloudy November morning. Embarkation was easy and we were on board by just after noon. As soon as we boarded we were greeted by the newly designed grand lobby which no longer houses two glass elevators to transport guests from deck 2 to deck 7. 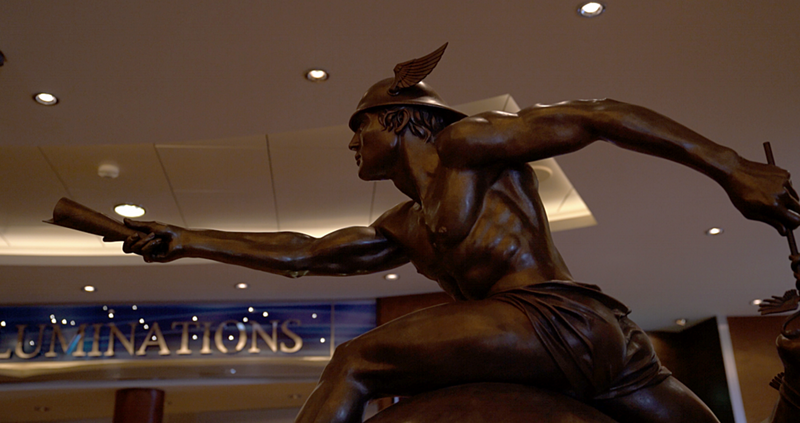 Although the reasoning behind removing them was to create a more open and airy feel to the grand lobby, they did provide a lovely focal point to the lobby area (as well as being hugely convenient) and our initial reaction to this change was one of slight disappointment. Nonetheless we made our way down to deck two, passed the casino and along to the Golden Lion pub for a traditional pub lunch. This has long been a tradition of ours upon boarding any of the Cunard Queens, with the crowds making their way up to the buffet, lunch in the pub is always quieter and kicks our holiday off with some delicious pub grub and a large glass of beer/wine. The Golden Lion pub is the venue for the ever popular trivia. The magnificently adorned corridors leading off the Grand Lobby. The Pursers desk located on deck 2 in the Grand Lobby. The beautifully decorated Grand Lobby. After lunch we made our way up to our room to drop off our hand baggage. Nostalgia dictated that we book a balcony room in the same grade and almost exactly the same place as the room we had stayed on in 2008. I have to say that I absolutely love the design and style of the rooms on QM2. They are furnished in light creams with lovely deep blue accents and something about them just makes me feel instantly calm and relaxed. The bathroom is relatively large for a standard cabin bathroom with a reasonably large shower (albeit with the dreaded shower curtain), fantastic lighting and a very nice marble look vanity top. The bedroom boasts plenty of storage, a large safe, a tea/coffee tray, a small double sofa, large flatscreen TV and a small dressing table. The balcony is large for the class of stateroom with plenty of room for two reclining chairs and a small table. There really is no better sight than the Welcome Back ice bucket and champagne glasses! The bed really is as luxurious and comfortable as it looks here. The lovely new sofa and dressing table, looking out to the glass-fronted balcony. 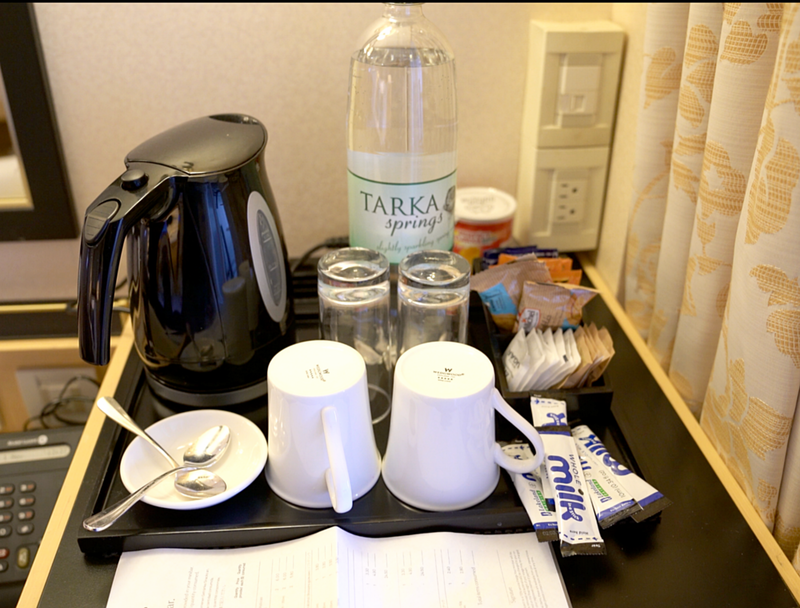 Not such an exciting refreshment as the bottle of champagne but still, a welcome addition to the room. After a quick refresh we left our room to have a wander round the ship and familiarise ourselves with the public areas. One of the places we were most keen to see following the refit was the Kings Court buffet and the Carinthia lounge (the old Wintergarden). Now, whilst I may not have not have been too impressed with the changes to the grand lobby the same cannot be said for the Kings Court and adjoining Carinithia lounge. Kings court has been opened up to create one large buffet area instead of the smaller sections there used to be. The area is light and bright and allows you to see all the different types of food on offer. And as always the buffet food on QM2 is varied and tasty. We loved the light, open feel to the redesigned Kings Court. Warm pastries in the morning and jacket potatoes at lunch time - found here! 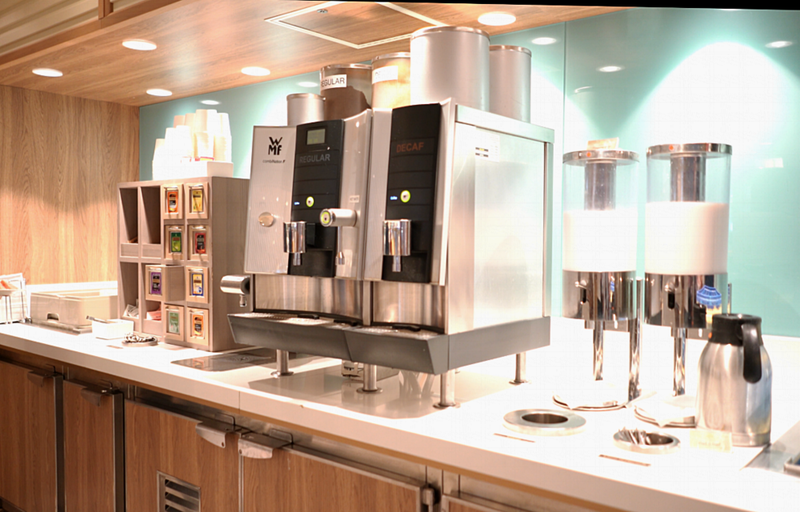 The self service tea and coffee stations. However, for me the best change is in the newly designed Carinthia lounge where they have also created an alternative dining area. The lounge itself is furnished in tones of cream and blue with a variety of styles of sofas and armchairs all creating a much more ‘loungy’ feel to the room than the old Wintergarden used to have, which always felt a bit like a tired old conservatory. And with this redesign they have installed a fabulous new drinks and coffee bar (serving Illy coffee) as well as a small food bar which serves smaller plates of food at breakfast, lunch and dinner time as well as snacks throughout the day. The lounge itself is now much more welcoming and gets used significantly more with live music in the evening turning it into another perfect venue for pre or post dinner drinks. Although the drinks menu is focused largely on port and wine when we asked for a French Martini and a Cosmo on our first evening on board, they weren’t fazed and produced two very good cocktails for us two enjoy whilst listening to some seriously good Dixie jazz. The Carinthia Lounge, such a pretty and relaxing place to while away the hours. We loved the decor and design style of the Carinthia Lounge. The wine stores and high chairs and stools in the bar area of the Carinthia Lounge. We loved these delicious small plates on offer throughout the day in Carinthia Lounge. 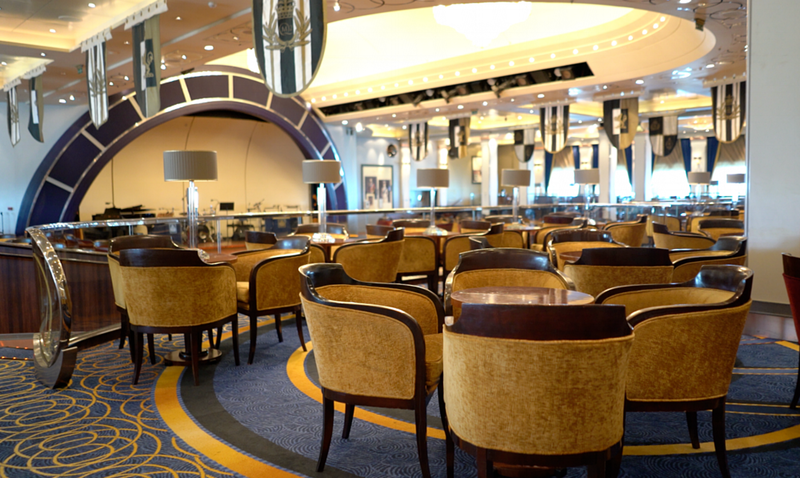 We decided that we would chose early sitting for dinner in this voyage since we weren’t intending in having long days off the ship and we hoped it would give us more time to savour the wide range of entertainment in the many venues in the evening. So after a quick visit to the open deck in front of the Atlantic room to watch Cunards Queen Elizabeth sail by us we made our way back to our room to get ready for dinner in the Britannia restaurant. We had a table for two on the upper deck of the tiered restaurant. There really is something very wonderful about this restaurant with its grand mural on the two storey back wall and its multi layered seating areas. And whilst I am not a massive fan of fixed dining times it is rather nice to have your own table with allocated waiters and sommeliers for the entire voyage. After a beautiful meal and a wonderful serving of Dixie Jazz we made our way to the show for some comedy. The Royal Court theatre is majestic and large and unlike some other ships we have sailed on we never had a problem getting a seat for a show, even if we turned up just before it started. My only gripe with the theatre (and it’s quite a big one) is the seating, which I just find so incredibly uncomfortable. Considering you are there to watch a 45 minute show so need to be able to relax and sit still for that amount of time, none of the seats are conducive to this. There are two styles of seats in the theatre and both are equally uncomfortable making the shows a bit of a challenge as far as I’m concerned. Anyway, after enduring the discomfort to stay put for the entire show there was time for a quick look around the shops before a late night cup of tea in Kings Court and bed. As we woke the next day the sun was rising for our approach to Zeebrugge, so we decided to take an early morning stroll around the upper decks before a quick session in the gym. The gym is divided into three main areas, one with aerobic type machines (elliptical etc), one with treadmills and one with the weights machines and free weights. This gym misses an area for floor work and a great sea view that many gyms ships have these days but the equipment is varied and plentiful. The new walkway created by the addition of deck 13 staterooms. After breakfast it was time to make our way to the Illuminations venue for a guest lecturer insights talk from an ex Cunard social hostess, who entertained us for nearly an hour with some of the history, personal stories and exploits from working on the old Queen Mary and QE2. Following a quick lunch in the carinthia lounge we made our way back to Illuminations for the very popular planetarium show, this being the only planetarium at sea. This venue is also used as a cinema often showing some of the latest movies, even with the capability to show 3D movies. One of the statues at Illuminations. As we were only here for two full days we would only have time for two of the infamous Cunard afternoon teas. And this afternoon it was the turn of the Godiva chocolate afternoon tea, served in the Sir Samuels coffee bar. There is a small cover charge for this but for any chocoholics out there it is an absolute must. Each person gets the choice of one of the Godiva cake slices served with the most delicious chocolate ice-cream, a white chocolate scone, and a selection of Godiva chocolates, all served with your choice of coffee or tea from the wide selection on offer in Sir Samuels. I challenge anyone to actually finish this platter of chocolate infused deliciousness - we had to take our chocolates with us to eat later! Tonight was our one Gala night so we changed into our glad rags and made our way to the Chart room for pre-dinner drinks, accompanied by some melodic piano music. On longer cruises formal nights usually involve a captains cocktail party and a special menu in the main dining room (often featuring beef wellington, lobster, baked Alaska and other culinary delights) but this being a three day voyage there was no party and the menu in the main dining room was a little underwhelming. Nonetheless we made up for it with a trip to one of our favourite bars, the Commodore Club, for a cheeky post-dinner cocktail before making our way to the theatre for the Royal Cunard singer and dancers excellent Broadway show performance. The Commodore Club bar and seating. We love the cream and blue tones of the Commodore Club. The Commodore Club, the best bar for pre-dinner cocktails. Just off of the Chart Room is the gorgeous Champagne bar. This being a Gala night there was ballroom dancing in the Queens Room with live music from the Queens Room orchestra. And if ballroom or Latin dancing is not your thing the nightclub, G32, is conveniently situated next to the Queens Room, which had the resident band playing more contemporary music for people who like to boogie. While we love people watching in the Queens Room neither of us are ballroom dancers, so no need to guess where we ended up! The Queens Room, beautiful day and night. The beautiful Queens Room and dance floor. The Queens Room with the adjoining entrance to the G32 nightclub. 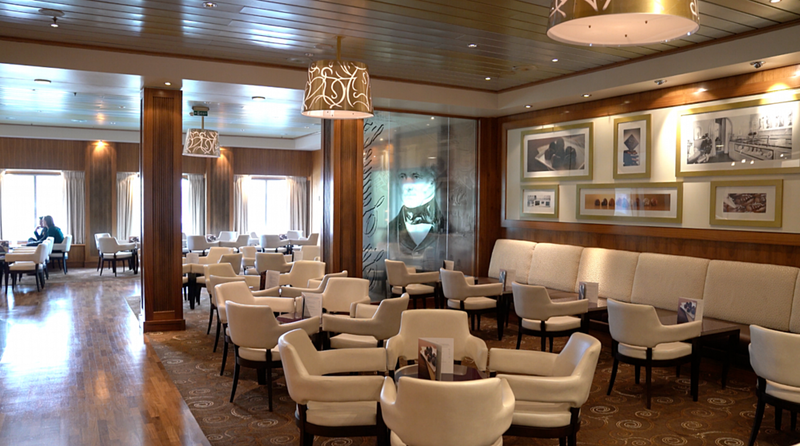 After a late night a bit of a lie-in was in order, but we were still up and out for breakfast before many of the other passengers and we enjoyed a quiet, leisurely coffee and light breakfast in the Carinthia lounge followed by a bracing walk around the promenade deck. One of our favourite get aways on the QM2 is the library so we headed up there for a little read and relax in the sleep-inducing chairs situated in the beautiful bow windows at the front of the library. Before we knew it it was time for a mid morning coffee so we headed back to Carinthia, which by now I’m sure you can see, has become our favourite place to watch the world go by with drinks and snacks on hand. 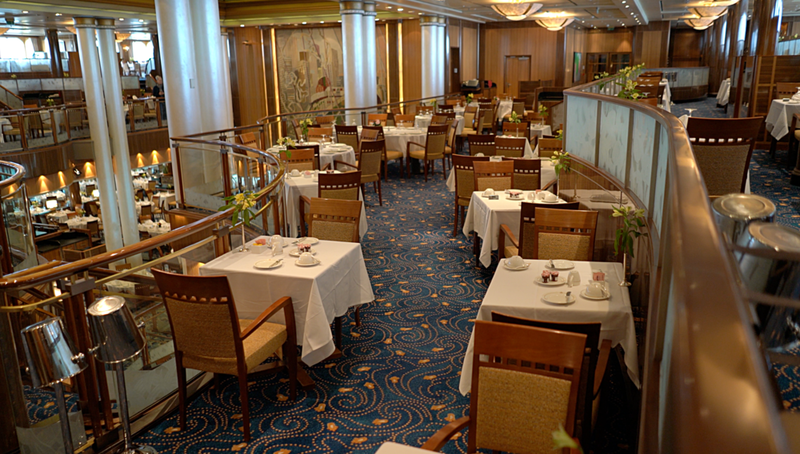 The beautiful teak clad promenade deck. The Commodores cufflinks (spare propellors) at the bow of the ship. The aft outside pools and sun decks. One of the lovely seating areas in the library. As the sun was now high in the sky we made our way up to the indoor pool to spend some time relaxing and snoozing on the loungers up there. But who can resist a dip in the pool followed by five minutes in the hot tub? After a quick dip and power nap we got dressed and ready for afternoon tea in the queens room. 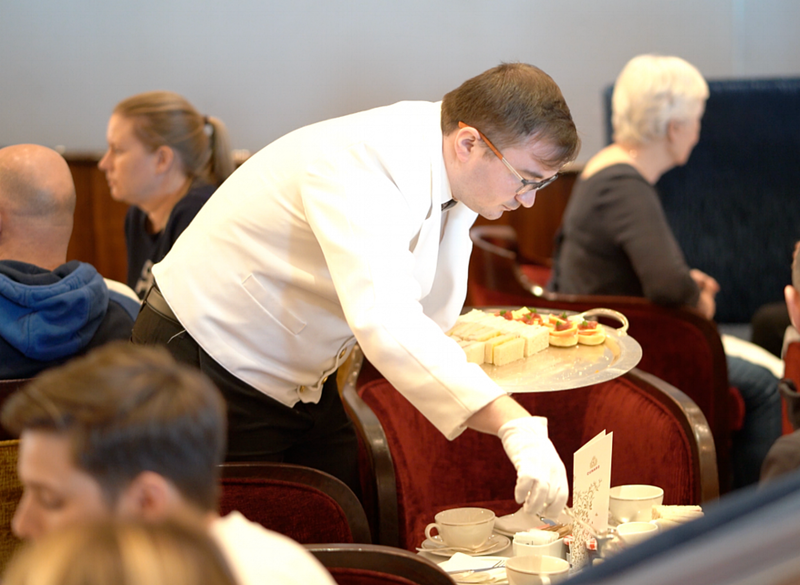 What can we say about afternoon tea in the Queens room, except that it is the most quintessentially ‘British’ experiences you will have whilst on the Queen Mary 2 and should be done at least once every voyage (though your waist line won’t thank you for it). The white gloved waiters serve sandwiches, scones and delectable cakes from large silver platters whilst your teacup is filled and refilled and the harpist plays melodically in the background. The upper deck indoor pool with retractable roof. Also in the solarium area. After tea there was just time for a quick cake-induced nap before we made our way out to the open decks for the sailaway party. It might have been cold out but there were still people in the hot tubs even thought the band had set up on the stage behind the pool to play us out of Brugges with a little jazz music. It was such a lovely atmosphere made even more special by the amazing sunset and skies that accompanied the event. A very romantic sail-away party with live jazz, pretty lighting and the most amazing skies. Since this was our last evening we had decided to visit the Verandah restaurant, the last of the list of newly imagined venues we had yet to see and the main alternative dining venue on Queen Mary 2. There is a small charge for this venue but for the attentive service and amount and quality of food on offer this is, again, something that should be enjoyed as a treat at least once a voyage. Though personally we both preferred the fine dining experience of the old style Verandah restaurant, the food and service could not be faulted and seem to fit in better with the fashion for chop house style eating. The theme is steakhouse and we both succumbed to the fillet steaks with lots of accompaniments, but there were plenty of other options, including some vegetarian meal choices. And the desserts were delicious! It might not look much but I still have dreams about this sharing bread, it was divine. Simple and succulent, fillet steak. Classic and delicious, apple pie and custard. So it was that with very full bellies and maybe a glass of wine too many we made our way back to our room to pack our bags for the dreaded corridor of suitcases evening which marks the end of every cruise. The next morning we woke early and managed to squeeze in a breakfast in the Britannia restaurant before heading back to our room and making our way off this magnificent ship. Disembarkation was easy and we were soon on our way home, and though this had been a short cruise it did not disappoint. Queen Mary 2 is a magnificent ship which everyone should sail on at least once if they have the chance. QM2, we still love you and will definitely be back soon. If you enjoyed this review of a mini-cruise then why not take a look at our mini cruise on Azamara Pursuit?